Going to the Chicago Food Swap last week inspired me to try some of those things on my cooking bucket list; one of them being JAM. I dreamed up making a grapefruit malört jam. I asked LCB, my guru of all things home cooking, to show me and on Sunday night, we made my dream into a jammmy reality; jam-ality. 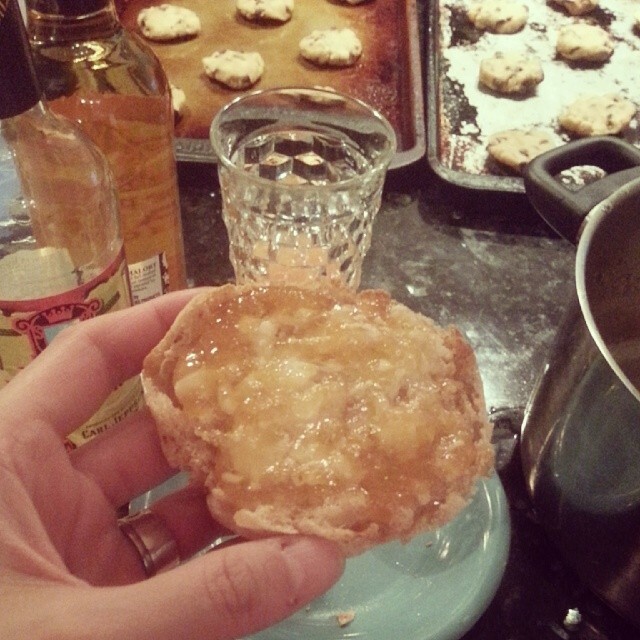 We tweaked one of the standard recipes and it was GLORIOUS. I’ve never had a jam like it and neither will you! The Malört after-taste is there, but nice and subtle. Use Jeppson’s Malört only, substitutions are stupid! This recipe made 7 half pints of jam. For the grapefruit, remove the membrane & seeds. I wish we’d seen this great FAQ here before tackling the segmentation. 5 medium grapefruits yielded 3 1/3 cups of segments. This week: Ukrainian Village Community Page Meet-up for Taco Tuesday @ Old Oak Tap. Spontaneous dinner with Stacy @ Thai Village. Anna Vogelzang/Steven Gilpin @ 914. A lonely Saturday. A super packed Sunday: Bongo Room, Mariano’s, Powell’s, Under the Skin @ Landmark, and making jam with LCB! In TV watching, I caught up with The Mindy Project, Kitchen Nightmares and watched Treme. 2013 Week 12: Every day, in every way, I am becoming a better feminist. Z snapped this photo of me in front of my Rhymes with Twee booth at Urban Folk Circuit @ Logan Square Farmers Market. Met some lovely people today and ate yet another delicious grilled cheese sandwich from Gayle’s Best Grilled Cheese. I wish that Urban Folk Circuit could sell through the entire farmer’s market season. I heard that from a number of shoppers today what a good pairing it was and I agree! Sweet Potato Carrot Goat Cheese Mash Shepherd’s Pie from A Cozy Kitchen. I bought nearly everything for this recipe at Plenty Grocery & Deli except for goat cheese which I had from Trader Joe’s. For the “meat”, I subbed in one pack of Upton’s Ground Seitan. 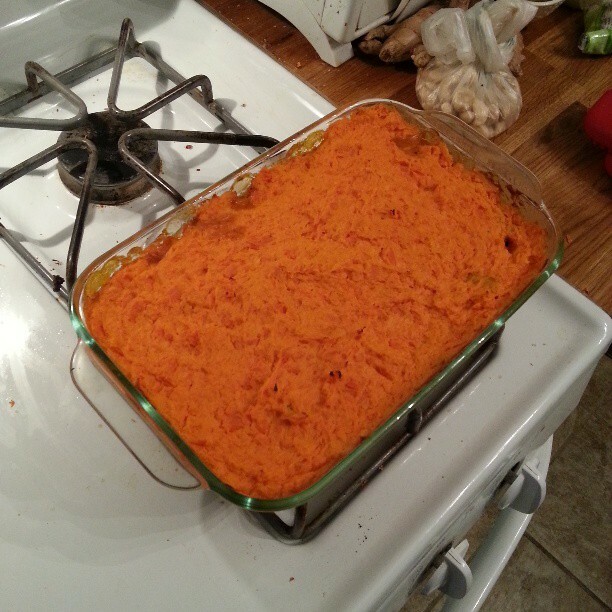 I used sweet potatoes instead of russet potatoes in the topping. I used heavy cream in place of whole milk. I didn’t use any flour since I wasn’t using real meat. I used Annie’s worcestershire sauce and vegetable broth in place of beef broth. This was one of the best things I’ve ever made. Zachary loved it too. Thanks #instacookingclub! North Sea, Texas was one of the best gay movies I have ever seen and I watch a lot of gay movies. A lot of them are terrible. This one was poignant, tender, and beautiful. Definitely a MUST-see. I posted the following on my Facebook page: Just finished watching the documentary dreams of a life. Honestly, it was one of the most chilling things I have ever seen. To have someone in this day and age die and not be discovered in their flat for 3 years is unthinkable. To have no family or friends report her as missing, no one in her building report it, utilities not reporting it. My heart hurts for this poor girl. While watching, I couldn’t stop thinking about my friend jeff barszcz who took his life last may and posted about it on his blog so that his cats would be taken care of. if he hadn’t, how long would it have taken for him to be found? I knew only a handful of people had his newer address. It still saddens me there was never a obituary for him. I don’t even know how to end this post. I would love to talk to someone about it. Watch the film. It is on netflix streaming. I have read a great deal about Steubenville and the judgment that came down. At this point, I have read something like 25 articles/blog posts. I have wept a lot this week because justice has not been served. Why is our society deteriorating in such a way? I also watched Girl 27 and it was a good bookend to the week. This week was all about strong women who did not deserve the hand they were dealt. Every day in every way, I am becoming a better feminist. Took Z out for his bday dinner @ Little Goat. I did a ton of cooking/baking this week. I blame Pinterest, which I got back into this week. On Vegan Vednesday, I made this creamy spinach artichoke dip, which used cashew cream. That day it was pretty good, but the flavor improved the next day. 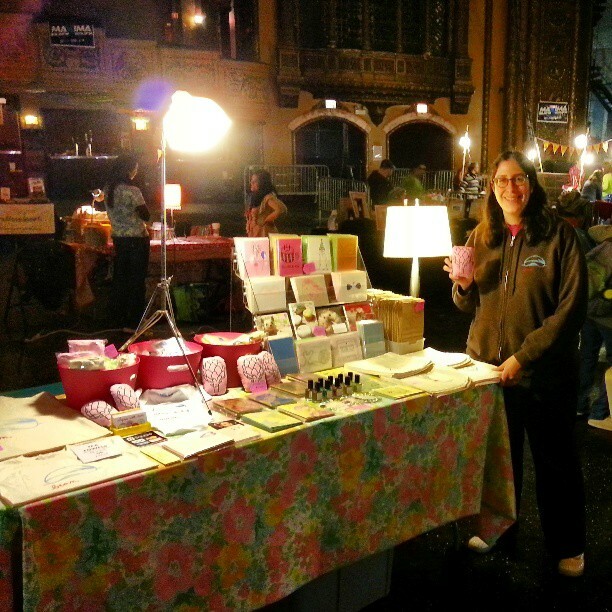 Attended the Creative Expo put on by the Chicago Artists Resource at Chicago Cultural Center. The workshop ‘Copycats Beware: Protecting Creative Works with Copyright and Other Intellectual Property Rights’, given by Kathleen M. Wilt, Attorney from Valauskas Corder LLC, on how to protect yourself as an artist from copycats was worthwhile, but the keynote speech by Chris Kaskie, President of Pitchfork, fell flat; with Kaskie talking a lot but not actually answering many of the questions from audience members. Went to Podhalanka and then saw The Magnificents put on by the House Theatre @ Chopin. Pardon my wordplay, but it was MAGICAL. Z and I don’t get out to see many plays, but this one was truly one to watch. The House Theatre Company excels at what they do. There was a sub for my fave spin instructor Saturday and he could have been John Waters’ brother. I added strength training before my two spin classes this week and my arms and legs are still achy! Went to breakfast at Toast 2 to visit Beth. Took Tilda on a massive walk. 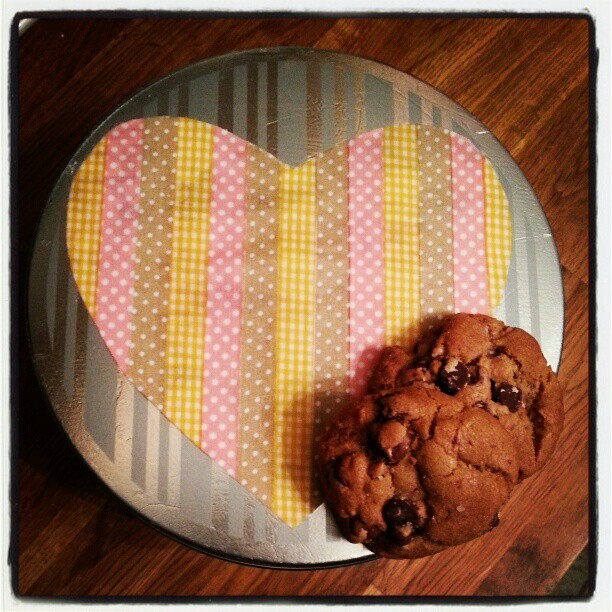 Tweekly make: Made those incomparable nutella-stuffed chocolate chip cookies and a tin to put them in for a coworker’s last day. 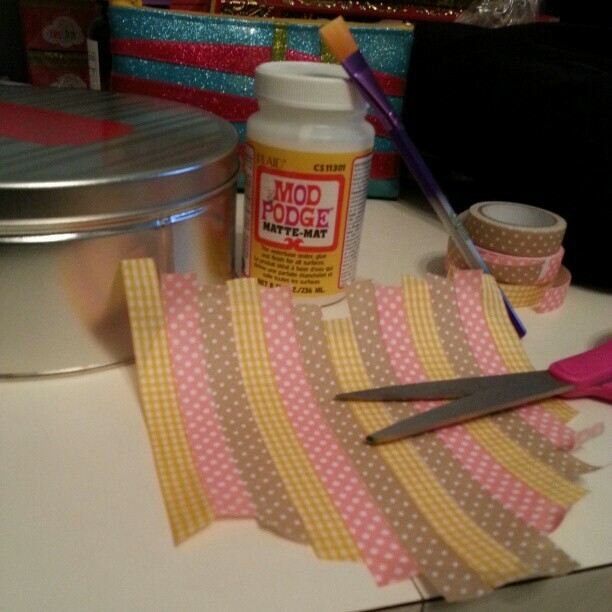 I cut a heart shape out of paper and used fabric tape in rows to cover it and then I cut the excess tape off. 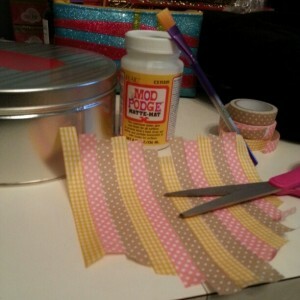 Then I used Mod Podge to stick it to a tin my work got corporate gift cookies in and kept reapplying Mod Podge to the heart. Parts started curling, so I put plastic wrap on the top and then set a plate on top of that to flatten it out. Once it was mostly dried, I took the plastic wrap off and applied one more coat of Mod Podge. I know my coworker will love the cookies once they make them to her. I also made Paul Newman cookbook: Nicole Kidman’s Crispy Orchiette with Broccoli, Pine Nuts, and Garlic from the Paul Newmans’s Cookbook. Way back in the day, a VERY similar recipe at Bite was almost exactly like this except it had raisins. The recipe from the cookbook was nearly identical to that recipe, except I forgot about the raisins until I was eating it. HUZZAH! So great when a recipe turns out as hoped! Wow, Scarface is really boring; so boring in fact that Beth and I fast-forwarded through about a half hour of the movie while Z gave us the plot summary. Breaking Glass; about an 80’s musician worried about selling out, was this week’s winner by a long-shot, although it ended rather abruptly. Z told me why – the US version cut the original ending, which I HATE knowing. The whole point of the film changed by lopping off the original ending. Gah. What’s worse is the ending is nowhere to be found on the internet. INTERNET, you disappoint me. 2013 Week 7: You bring feeling to my life. You’re my SPINspiration. Tweekly make: wedding save our dates, the wedding website, and the delicious thrown together dinner pictures above. For Vegan Vednesday, I made Trader Joe’s 10-minute farro, tossed in some sauteed TJ’s brussel sprouts and garlic, a bit of Beautiful Briny Sea truffle salt, squeezed the juice of one lime over it, and a splash of olive oil. This was one of the best dishes I think I have ever made. The three servings I had of leftovers were equally satisfying. Yum x 100. Had an initial visit with a new doctor since my doctor moved to Evanston. Saw four movies in the theatre this week. Had gin drinks at Scofflaw with Jen and Amanda. Went to Casa del Puebla with coworkers. Discovered Goody Good Stuff candies, which are vegetarian (no gelatin or confectioner’s glaze) and some are vegan. They even have gummy peaches!!! Awesome spin classes this week and my fave instructor Julie set my spin shoe cleats up so they are now perfect for riding. She is my SPINspiration. I bet she will love that I just called her that. My pants are all hanging so loose around my waist and I hate wearing belts! I refuse to buy a new pair of pants until I am fully two sizes down. Since I started spinning 7 weeks ago, I have not been losing weight because my body is gaining muscle and toning up somewhat. I want to add another class or two in during the week, but my dance card has been so full lately. 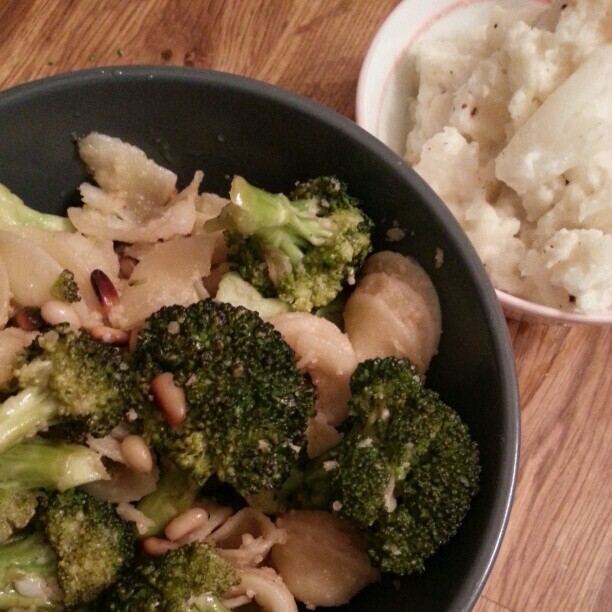 2013 Week 5: I prefer bowl of supper to bowl of super. Tweekly make: Pictured above was my first foray into the instagram cooking club some friends started. 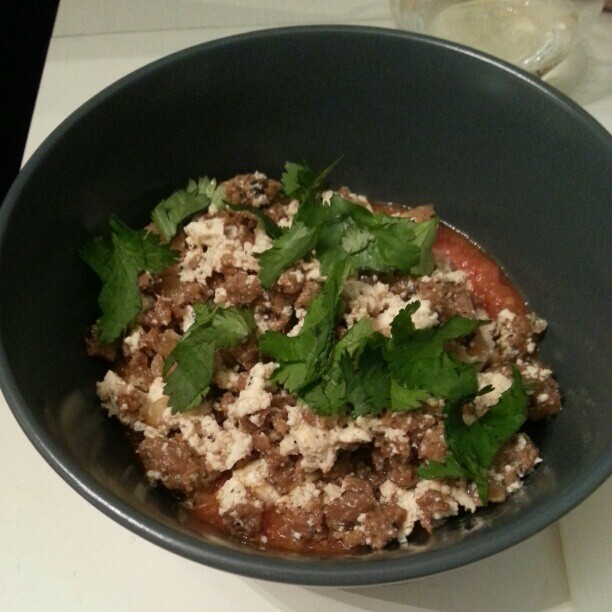 The recipe everyone made was Sue Torres’ Migas from Smitten Kitchen. Because the cooking date fell on Vegan Vednesday, I veganized the recipe, subbing tofu for the eggs and Upton’s Chorizo-style Seitan for Chorizo. Otherwise, I followed it exactly. 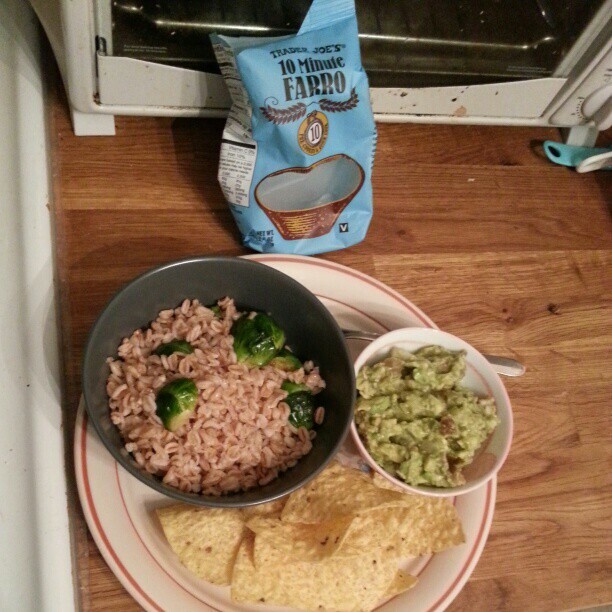 Let me say…after taking the hardest spin class thus far and coming back to cook straight afterwards; this was easily one of the best meals I have ever made. Special thanks to Megan for helping me with prep. Who knew that making tortilla chips was so easy? Good week. Dinner with Z & Donovan @ Sun Wah. Dinner with Stacy @ Butterfly. Had my review at work and it went well. Nick’s bday party. Indie Wed. Brunch with Anna @ Handlebar. Avoided the bowl of super entirely! Dropped off yellow 6 month bean baby onesies and replenished Hermione Hearts You postcards at Paper Doll. Go get ’em, kiddos! Also, Rhymes with Twee Etsy sales have been blowing up lately and Shop Stats are giving me no insight into why. I love it, but what is going on? Thanks, guys! No One Knows About Persian Cats was a must-watch. To get a small glimpse into what is actually going on in Iran was fascinating. I actually bought the soundtrack as soon as the movie was done because the bands featured in the film were great. I haven’t bought a soundtrack in ages. 2013 Week 1: So this is the new beer? I used the crock pot I won at the work holiday party to make something just mediocre – recipe hunt has begun. First Vegan Vednesday was super easy. Lunch with C Begs and Mike @ Bite. Work Book Club @ Inspiration Cafe. Went to the first new-to-me restaurant (see my resolutions post), Amitabul. Took my first spin class at WPAC and can barely walk and sitting down is worse. New Beer’s Eve @ Kris & Joe’s. Tilda training with Erik. 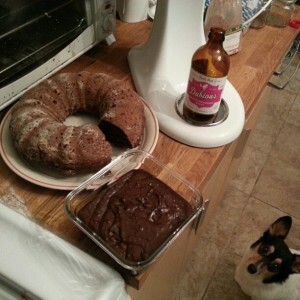 Tweekly Make [this is what I’m calling my version of make great: For New Beer’s Eve, I made Chocolate Stout beer bread with this recipe (my make great for the week). I used North Peak’s Dubious black chocolate stout. Mix with hand mixer or stand mixer until smooth and creamy. Next time, I would heat the coconut oil to bring it to liquid form pre-mixing. I didn’t and mine remained lumpy. It was a HUGE hit spread onto the chocolate stout bread though. Excellent first week for films! Faves: Sleepwalk with Me, Quill, (A)sexual, Craigslist Joe. So, I finally watched The Godfather. I don’t feel like my life has changed, but I am happy that I’m 1/3 done with the trilogy. 2012 Week 50: Be an Elf, baby. Gifts for Peyton; one of the two kids we picked from the USPS Letters to Santa/Be an Elf. Isn’t that dress the best thing ever!? I love doing this more than any other holiday things and next year, you should think about it as well. 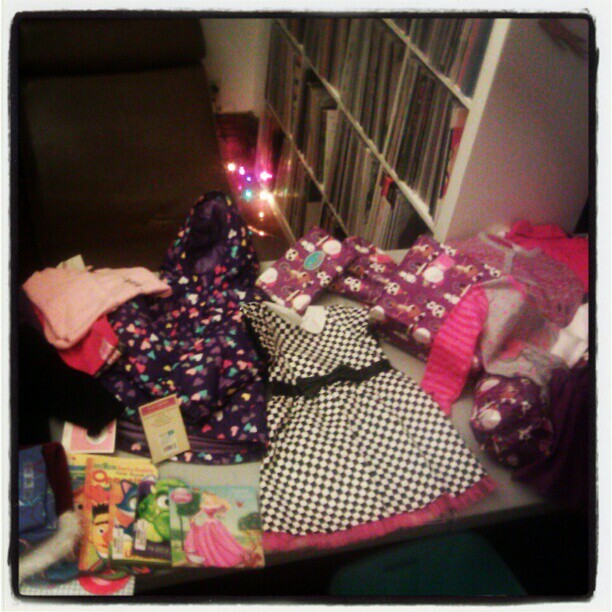 Special thanks to Megan for going crazy at H&M and buying such darling clothes for Peyton and Amanda for all the books! I heart my friends! This was a very productive week. Did mega errands and got rid of a lot of stuff. Went to two work-related holiday parties; ICNC’s at Garfield Park Conservatory and Z’s at LuxBar. Saw HellCab at Profiles Theatre. It was SO fantastic. Went to three most excellent holiday parties Saturday night. Had a lovely potluck brunch party where friends brought in gifts or helped wrap for the Be an Elf letters we had picked. I made the buffalo chicken dip again and a veggie version by sauteeing two boxes of tofu, which was a big hit as well! I also made these Martha Stewart blueberry scones for Beth’s bday.